I was listening (and listening and listening) to Dr. Horrible as I did my evening chores. Seriously, I was outside in the evening breeze hanging laundry on my clothesline, singing about underthings tumbling, and with my freeze-ray I would stop (clothespin) the world, and so on. The third act came on while I was making my bento for tomorrow. I think Dr. Horrible got into the food. Left: Evil-looking chard leaf lid over the steamed lunch veggies. ( executrix got me to buy chard.) It looks like a tree of blood. 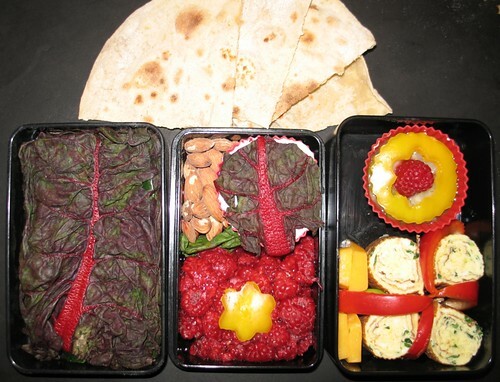 Middle: Breakfast of yogurt under the other chard leaf, some almonds, some raspberries, a yellow-pepper flower. Right: Too much empty space around the rolled omelette with red-pepper dividers, and some pickled cucumber salad with a yellow-pepper-and-raspberry lid. And cheese. Cheesy cheese. Above: flat bread that can't go into the box without getting soggy. And I listened all the way through the very, very end (which I hadn't had the heart to do up to now) and eeee! "Grrr...Aaargh." Can I just say how happy it makes me to hear that again? Oh Joss. Mwah! Love you to pieces.